Teasing the End Too Much? We’re a little surprised too. We weren’t really expecting to see Katniss marching in the Capitol on her way to execute… Snow in the Mockingjay Part 2 teaser trailer. We were expecting a little more focus on the beginning of the film. It’s not that we didn’t LOVE seeing that scene, or other scenes that we know are later in the film. The execution scene with Katniss aiming her arrow is a great call back to the other films so it certainly stays with you. But to have them in the teaser trailer, the first glimpse of the film, is unexpected. Then EW released a “new” still yesterday. Well, we don’t consider it all that new, because it’s a scene from the teaser where Effie is helping Katniss prepare her look for Snow’s execution. But there it is again – drawing focus on a scene from late in the film. What’s interesting about the choices to reveal things that happen from the very end of the film is that they don’t necessarily reveal too much of the actual plot to non-book readers. Sure, you see Katniss leading people in the Capitol. But come on, even casual movie watchers know this is where the story is heading anyway. These moments have a strong visual impact, and can help sell the movie. Book readers know what happens anyway, and the non-book readers won’t understand all the context enough to be truly spoiled. Like in the scene from the still above. 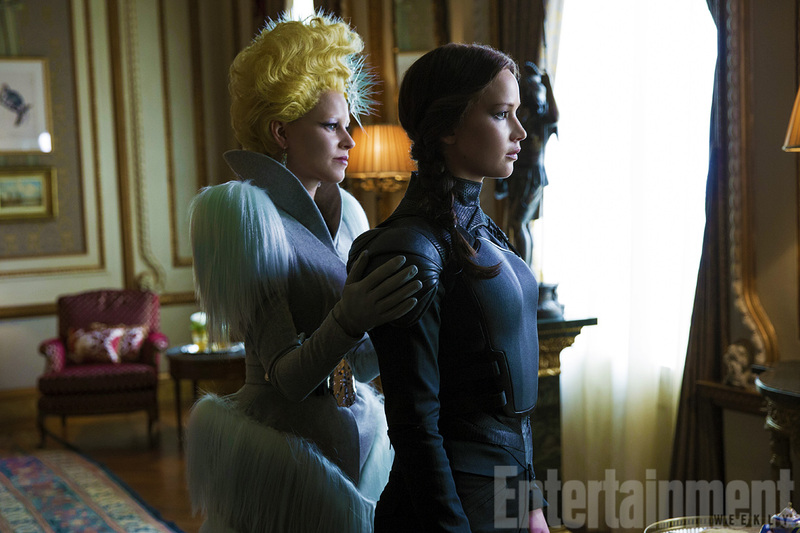 Katniss and Effie are clearly in the Capitol from the surroundings and Effie’s newly regained colorful outfit. Us book readers can distinguish other small things that reveal the timeline – the uneven end of Katniss’s braid indicating singing from fire bombs – but a casual viewer isn’t going to notice that. The casual viewer probably isn’t thinking about the timeline at all. They’re just seeing a return to Effie preparing Katniss for her latest big big big day in the revolution. So yes, it’s surprising that they’ve already revealed some shots from the end of the movie, but we think it helps build continuity as we march toward this EPIC CONCLUSION. If they showed Prim with parachutes in the distance, that’s another story. Well said. I think it’s just us fans that get antsy about these things since we know where the story is going. Casual fans won’t give a crap. What’s good is that they are actually marketing the movie this time and people (general audiences) are starting to be aware of the film. Even from the surroundings in the above still non-readers won’t necessarily assume this is the Capitol. Don’t forget we haven’t seen much of the other districts and could easily guess this scene takes place in D1,2, or 3 as much as the Capitol. (not myself personally I’ve read the books). I think they release enough for fans so that we know what made it into film, etc, and for regular movie-goers as well, so they get just enough to get excited for..as you mentioned. It may be clear from the surroundings and Effie’s outfit that they’ll revisit old familiar places, but remember, after Catching Fire non-readers were not expecting the stark drabness of District 13 in Mockingjay Part 1 – and maybe fans weren’t entirely prepared for it either..